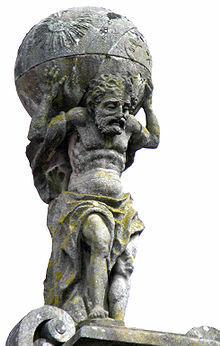 Sculpture of Atlas inaccurately depicting him holding the earth on his shoulders. I recently had an opportunity to interview Atlas, the Titan god of astronomy and navigation. Because he and his brother Prometheus found themselves on the losing end of the war between the Titans and the Olympian gods, Atlas was condemned by Zeus to stand forever on the western side of the earth, holding the sky on his shoulders. A few years ago, high-speed internet service became available on the western side, and Atlas was able to take some Alexander Technique lessons using Skype. We also used Skype to conduct our interview. Me: Atlas, it’s a great honor to talk with you today. Atlas: It’s a pleasure to chat with you Robert! I feel I owe a great deal to the Alexander Technique and I’m happy to assist in any way I can to let others know how helpful it can be. Me: I’m a little ashamed to admit that until recently I was unaware of your back story – how you came to to your present situation. And I originally thought you had to hold up the earth itself. Atlas: The other Titans and me often have a good laugh about that! Think about it – if I were holding the earth on my shoulders, what would be holding me? Me: Indeed. But I assume is was something about your work that brought you to the Technique? Atlas: It was. As you know my work IS my life – I have to stand in basically the same place 24/7, 365 days a year, keeping the sky from falling. Even with my astonishing size and strength, it’s a lifestyle that can easily lead to physical discomfort and even pain. Me: What were the specific issues that brought you to the Technique? Atlas: My main issues were neck and shoulder pain and extreme discomfort in my legs. it was the leg issue that turned out to be primary, so to speak. Me: Please tell me more. Atlas: Well my Alexander teacher pointed something out that I’d never thought of: While I had to stay in pretty much the same place all the time, I didn’t need to fix my legs the way I had been doing. There were possibilities of small movements in my ankle, knee and hip joints which I could make – small amounts of bending, twisting etc which allowed me to introduce some ease in my legs. At first, my teacher suggested simply experimenting with these tiny movements without any specific Alexander directions, but once I’d become used to them and didn’t worry that I’d drop the sky, she suggested I combine the movements with what she called Freedom Directions* like “I’m free” or “My ankles are free” etc. Those directions, combined with the movements, created a whole new quality of ease in my legs. They came to feel like living parts of me, not like stone pillars, and I found over time that I could move my leg joints through larger and larger ranges of movement. Eventually I could even move around a little! Me: That’s wonderful Atlas. What was the solution for you neck and shoulder pain? Me: So that meant that your shoulders didn’t have to work as hard? Atlas: Exactly! I came to realize I could substitute ease and balance for fixing and holding – I could be a channel between sky and earth, allowing the downward pull of the one to nicely balance the upward push of the other. Needless to say, my life has become a lot easier and more pleasant. Me: I’m so happy for you Atlas! But, still, don’t you find it a bit bothersome to have to be doing the same thing all the time – no vacations, no time to visit with the kids, no time to kick back and just enjoy life? And, to tell the truth, sometime at night, when nobody is looking, I do a little dance using my new flexibility and balance. Life’s good for me now, and I’m so glad I’ve been able to benefit from F. Matthias’s Alexander’s discoveries. Me: Atlas, thank you so much for this interview. And, on behalf of all the inhabitants of the Earth, thank you for keeping the sky from falling.